We want our customers to feel special. A loyal customer is our business strategy. We started with a simple formula in mind: customers want knowledge and direction alongside low prices, website functionality, and good design. Today we can say WE DID IT! Some of the real reviews of shopping experiences in WebyShops, found on the web. Easy website to navigate. Excellent product information. Very good merchandise pricing, reasonable shipping. Business associated with site gives thorough contact information. So far, so good. They have the best prices on the Web. I would recommend this company to everyone. The shipping is fast and customer service is the best. They are always friendly and helpful. They make you feel like they are part of your family. A++++ First off let me say that the customer service and professionalism is enough to put competitors out of business. I was a walk in customer after seeing several lower than market prices on firearms. Extremely fast shipping. I ordered Friday and chose the free 4-7 day shipping. My product came in the next Monday. I was shocked. Packaging looked fine and product was what I ordered. I’ll be doing business with them again. I had my doubts but I have to say… the product was in stock, shipped within a few hours and arrived in great shape. A better price than anyone else along with free shipping? Very hard to argue with any of that. Based on this I would definitely buy again. I have always gotten help and quick service. Large selection of firearms. Good selection of magazines and AR accessories. They expanded from the little shop they were in and the new shop is really nice and well stocked. We are committed to helping you achieve victory by providing you with a personalized online shopping experience to equip all of your needs. We live out the passions we have for adventure and the outdoors and share these experiences with those we love. We deliver an unforgettable experience to our customers from purchase to usage. Some of the real reviews of shopping experiences in 1800Gear & 1800GunsAndAmmo, found on the web. The customer service is always accommodating, but strictly business. Very helpful staff, nice customer service & great prices. I would order from this company again, great prices! Great local gun and outdoor gear shop. Awesome staff and service! 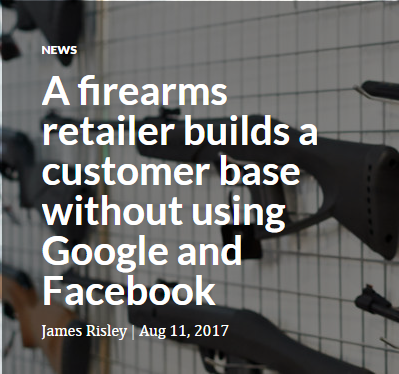 When the world’s biggest on-line retailer decided to exclude the products of an entire industry a few years ago, Mikhail Orlov, the CEO of an online and bricks & mortar shooting sports retail store in Arlington, Texas, saw an opportunity. If Amazon would not sell his products, he would make an Amazon style marketplace for the shooting sports industry himself. He is uniquely qualified to do it. Are Google and Facebook vital to growing a customer base? 1800GunsAndAmmo.com proves that the most popular online customer acquisition options aren’t a necessity. James Risley from www.digitalcommerce360.com talks to Mikhail Orlov, CEO and co-founder of Webycorp, No. 703 in the Internet Retailer 2017 Top 1000 about other ways to gain customers and drive sales when two primary digital advertising channels are off limits.